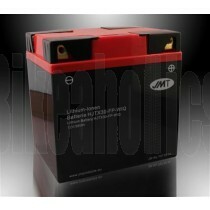 New Gen lithium ion batteries are now available for riders who would like to save weight in a cost effective way. 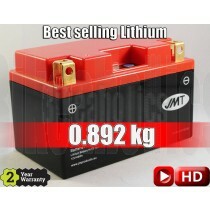 Do you remember the old days when your laptop and mobile phone used ordinary batteries? 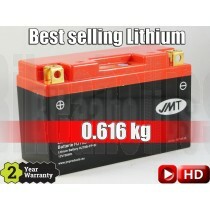 What a step forward the invention of Li-Ion batteries were! With conventional battery today's smart phone would be so heavy that it should be sold with built in dumbbell app and you could do your daily biceps training just by carrying it around. The manufacturers only option would be to reduce weight only allowing a couple of hours without charging (that if you don't use it at all). You might also remember how regularly you needed to replace the battery whereas today in most of the gadgets you won't even be able to remove the battery as its lifespan is longer than the actual gadget's. 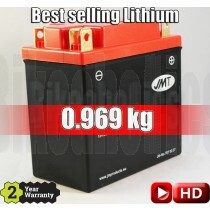 Lithium Ion batteries most certainly make our everyday life much more convenient, so why would you use 19th century technology for your motorbike or scooter when since the mass production it is no more the privilege of professional riders. Consider how much you would pay to shave a few kilos from your set-up by replacing your exhaust with a titanium one, or fitting light weight wheels . 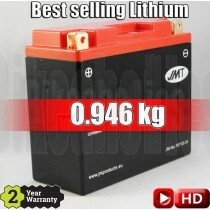 By fitting a Li-ion battery these weight savings can be achieved for a fraction of this cost. Makes it ideal for custom bike builders where the placement of the battery could be a headache. Let your fantasy rumble and make a bike truly special. Due to their design, Lead-acid batteries can use as little as 30% of their capacity when starting your bike. Lithium-ion batteries consistently use nearly 100% of their capacity, meaning a Li-ion battery can provide the same starting power from just one third of the capacity of a comparable lead acid battery. 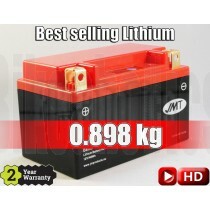 Please check the link at the end of my video, where you can see how effortlessly a JMT Lithium-Ion battery designed for motorbikes can start a 2L Toyota Camry...easy-peasy. 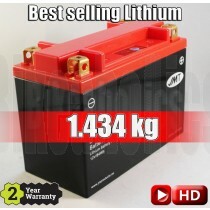 No ordinary motorbike battery is capable of doing the same. Uniform charging of all cells is ensured by a built-in processor (the "balancer"), minimising any excessive wear on any one cell, prolonging battery life. Up to 2000 cycles compared to 200 - 300 cycles of an old fashioned battery. 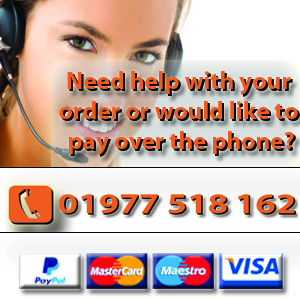 Perfect for track bikes or street fighters where the weight is the most important factor. 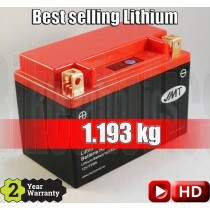 The dimensions of lithium-ion batteries match the dimensions of the original lead-acid batteries by use of spacers, contributing to weight savings. The electrical connections of Li-ion batteries are identical to those of the equivalent lead-acid battery, so the existing battery can be replaced within minutes without the need for further modification. 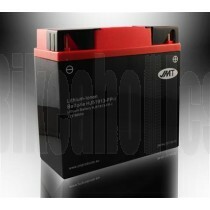 JMT lithium-ion batteries can be recharged using standard motorcycle battery chargers. The normal charging current usually corresponds to the battery capacity (e.g. 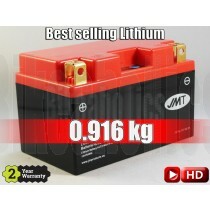 2.8 Ah capacity = 2.8 A charging current). 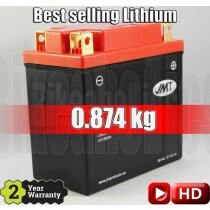 On a quick charge, however, Li-ion batteries can be charged on a current that is ten times the battery capacity (e.g. 2.8 Ah capacity = 28 A charging current). 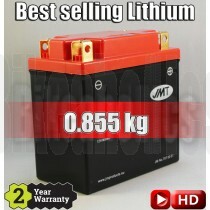 Due to longer life-time and no heavy metals nor acids it is much more environmental friendly than an ordinary battery. It should be noted that constant sub-zero temperatures can affect the performance of the battery and it is not the best option if you would like to use it in the winter in Alaska or Siberia, however if you don't plan to ride it in the snow, it is just the perfect battery all year around in the UK climate.